I lived in New Zealand from April to October, 2008. It isn't a particularly large country, but one would be hard pressed to find a place with as many "WOW! "s per square mile. 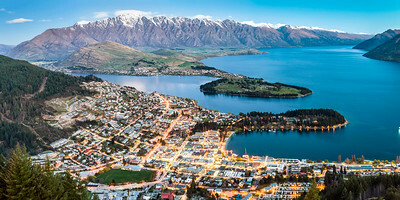 I lived in Queenstown, New Zealand, for a few months in 2008. The lake shown here – Wakatipu – stretches for miles in either direction of Queenstown. It's hard for me to believe that this was my view every day for a few months! Available in the following sizes (Panorama B): 30x12, 40x16, 50x20, 50x20 Triptych (3 x 17x20). 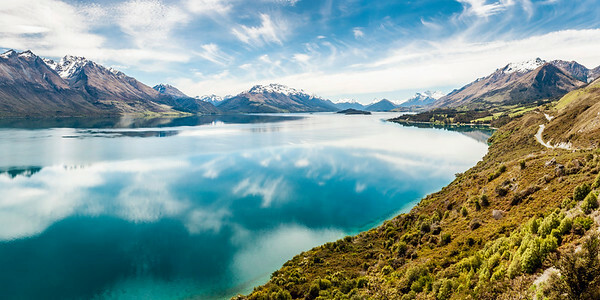 Lake Wakatipu, at 50 miles in length, is New Zealand's third longest lake, and covering roughly 112 square miles, it is the country's third largest lake. I lived in Queenstown, on its northeastern shore, for five months, and was able to appreciate the beauty of this lake on a daily basis. This shot was taken on the drive from Queenstown to Glenorchy. Available in the following sizes (Panorama A): 20x10, 24x12, 32x16, 40x20. Stewart Island, which lies just south of New Zealand's South Island, is home to an array of wildlife, as well as 381 permanent residents, as of the 2013 census. 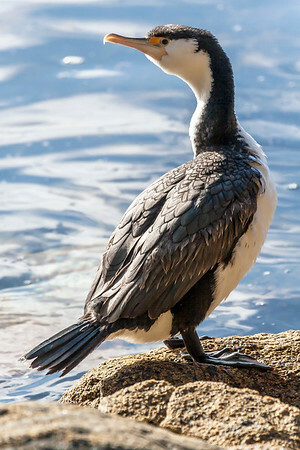 It was here that I took this photo of a cormorant. Available in the following sizes (Rectangle B): 8x12, 12x18, 16x24. 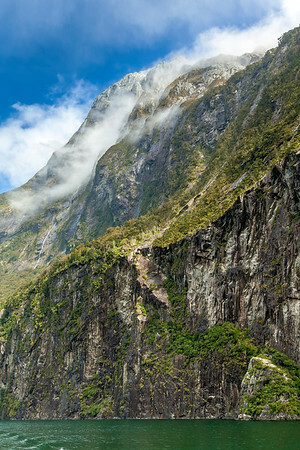 Milford Sound is one of the most beautiful places I have ever seen. Occupying the southwest portion of New Zealand's South Island, it was judged in 2008 by TripAdvisor to be the world's top travel destination. With scenes like this, it's no wonder why. Available in the following sizes (Rectangle B): 8x12, 12x18, 16x24, 20x30. Unknown mountain near Milford Sound, Fiordland National Park. Available in the following sizes (Rectangle B): 12x8, 18x12, 24x16, 30x20. Lake Tekapo is one of three parallel lakes near the center of New Zealand's South Island. Occupying 32 square miles, it's relatively high elevation – 2,330 feet above sea level – allows it to run several power stations. Available in the following sizes (Panorama C): 30x10, 36x12, 48x16, 48x16 Triptych (3 x 16x16), 60x20, 60x20 Triptych (3 x 20x20), 72x24, 72x24 Triptych (3 x 24x24). 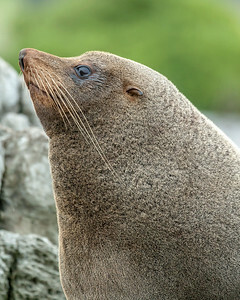 One of many seals I saw at Whites Bay, on New Zealand's South Island. Available in the following sizes (Rectangle A): 8x10, 11x14, 16x20, 20x24. I took this photo early in the morning near Ship Creek, on New Zealand's South Island. This was early-on in my photography hobby – long before I was doing this professionally – and I don't even know the name of the lake shown. I do a better job of keeping track of my shooting locations now! Available in the following sizes (Panorama B): 30x12, 40x16, 50x20, 50x20 Triptych (3 x 17x20), 60x24, 60x24 Triptych (3 x 20x24). 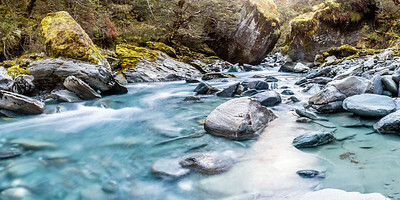 The Rob Roy track, on New Zealand's South Island, is a relatively easy 6-mile round trip hike that takes one, ultimately, to the Rob Roy Glacier. 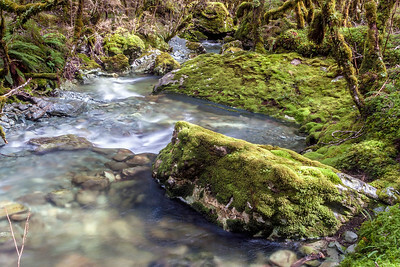 It is this very glacier that feeds the stream in this photo, and the beautiful, blue color of this water is due to the water being glacial runoff. Available in the following sizes (Panorama A): 20x10, 24x12, 32x16, 40x20. 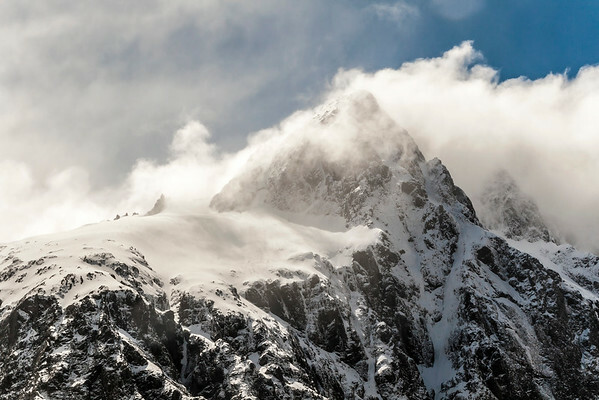 I don't know the name of this mountain, only that I took it in Mount Aspiring National Park. I know that it is not Mount Aspiring, though. 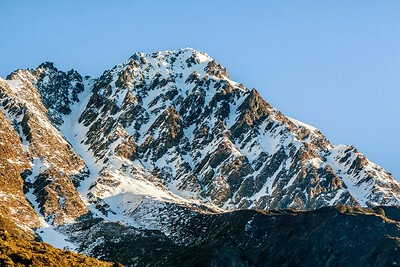 The mountains on New Zealand's south island are beautiful, and the afternoon light created a perfect contrast of light and dark on this mountain. Available in the following sizes (Rectangle B): 12x8, 18x12, 24x16, 30x20. I lived in New Zealand for 7 months in 2008, and went on several of this beautiful country's renowned Great Treks, including the Greenstone-Caples trek, where I took this photo. You wouldn't guess it by looking at this photo, but less than an hour before I captured this image, I was walking through a blizzard. Available in the following sizes (Rectangle B): 12x8, 18x12, 24x16. 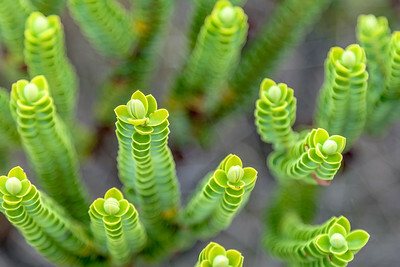 I have no idea what this plant is, but it was all around me while on the Mount Crichton track of New Zealand's South Island. Available in the following sizes (Rectangle B): 12x8, 18x12, 24x16, 30x20. I lived in Queenstown, New Zealand, for a few months in 2008. Situated on the shores of Lake Wakatipu, and nestled between mountain ranges, Queenstown is one of the prettiest places anyone could ever hope to live. Available in the following sizes (Panorama A): 20x10, 24x12, 32x16. This photo, taken on the Coromandel Peninsula of New Zealand's North Island, is typical of New Zealand. Major portions of this island nation are mountainous , and the steps on the hill on the right side of the photo are also common. A few dozen sheep grazing on the lush, green grasses really completes this photo. Available in the following sizes (Panorama A): 20x10, 24x12, 32x16, 40x20. Tauranga, on New Zealand's North Island, is the fifth largest urban area on this small, island nation. A short hike up Mount Maunganui offers one this view of the city. Available in the following sizes (Panorama C): 30x10, 36x12, 48x16, 48x16 Triptych (3 x 16x16), 60x20, 60x20 Triptych (3 x 20x20). A friend and I took a water taxi from Marahau to Bark Bay, in New Zealand's Abel Tasman National Park, in April, 2008. 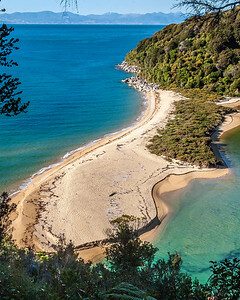 Being dropped off at Bark Bay allows one to do a single day portion of the famous Abel Tasman Coast Track, and it was on this track that we spotted this beautiful, serene, beach-like peninsula that separated something of a lagoon from the Cook Strait. Available in the following sizes (Rectangle A): 8x10, 11x14, 16x20. I hiked to Munro Beach on an evening in April, 2008. I'd never heard or read anything about it being a pebble beach, as opposed to sand, but to my great surprise, that's exactly what awaited me, when I arrived a bit before sunset. 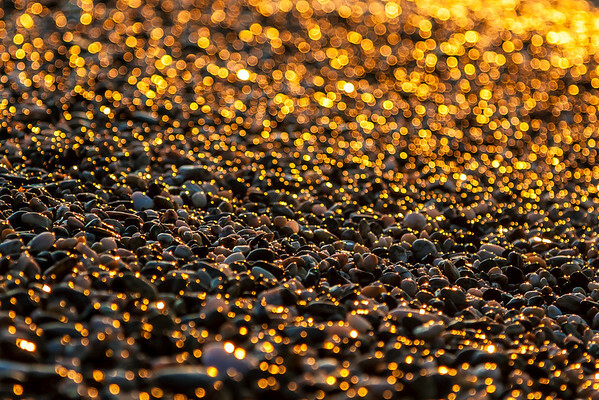 The late day's sunlight reflected off the pebbles in a magical way, as shown here. I returned to Munro beach several months later, and the pebbles had been replaced with sand. I don't know how it was that I was lucky enough to be there when I was, but I am thankful for it. Available in the following sizes (Rectangle B): 12x8, 18x12, 24x16, 30x20. Nugget Point, on the South Island of New Zealand's spectacular Otago Coast, is simply beautiful. 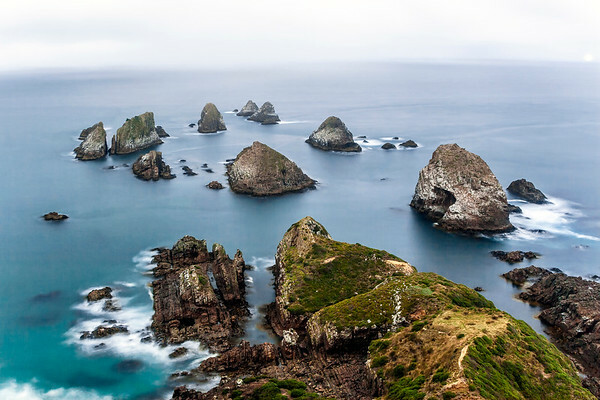 In addition to the simple natural beauty of this location, it is also home to many seabirds, and a breeding colony of fur seals. Available in the following sizes (Rectangle B): 12x8, 18x12, 24x16. 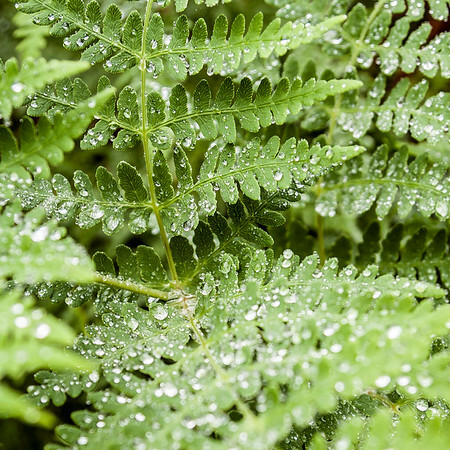 Morning dew deposited on a fern. Shot in the southern region of New Zealand's South Island. Available in the following sizes (Square): 10x10, 12x12, 16x16. 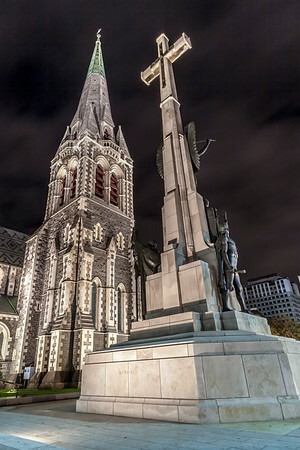 ChristChurch Cathedral, in Christchurch, New Zealand, was built between 1864 and 1904, but due to being in such a seismically active area, it has been damaged in six separate earthquakes, most recently in February 2011. Because of earthquake damage, it has been partially demolished since I took this photo in April, 2008, and what will ultimately happen to it remains unknown. Available in the following sizes (Rectangle B): 8x12, 12x18, 16x24, 20x30.